In 1972, Sun Ra inked a high-profile deal with ABC / Impulse, bringing his recorded work to the widest audience he’d had to date. A slew of Saturn back catalog titles and two newly-recorded albums (Astro Black, Pathways To Unknown Worlds) were issued before ABC cancelled the contract, dumped the records into the cut-out bins, and left the unreleased albums to languish. Now, over four decades later, Roaratorio is proud to offer one of the lost Impulse recordings for the first time. Sign Of The Myth hails from the same studio session as Pathways, and shares its emphasis on guided improvisations. With a constantly shifting palette of Moog textures, Ra tosses off a dazzling array of ideas throughout, supported by the usual Arkestra stalwarts; in particular, bassist Ronnie Boykins and drummer Clifford Jarvis are in shining form here, giving shape and solidity to these pieces. 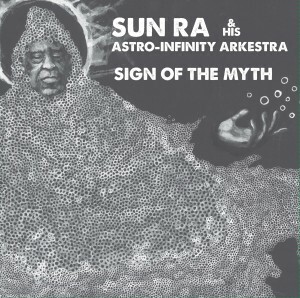 Sign Of The Myth is a welcome augmentation to an especially fertile period from Sun Ra’s time on Earth. Download coupon included.